Abstract: Workaround for install error 2318, insufficient privileges to modify etm.exe and etm.jdbg when installing RAD Studio XE Update 1. 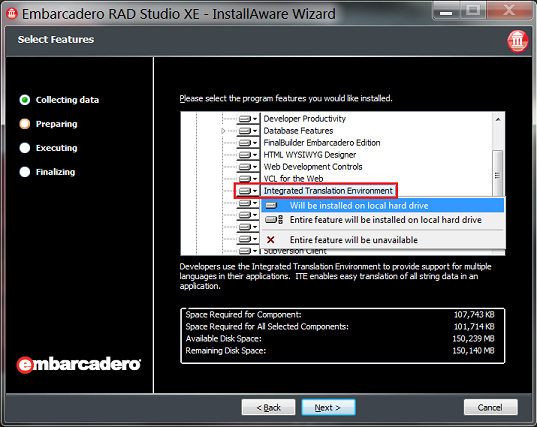 Some users are experiencing error 2318 when trying to install RAD Studio XE Update 1. The error occurs when the installer tries to update the Integrated Translation Environment (ITE) feature but it is not present because the feature was turned off in a custom installation. The update installer can be tricked by creating dummy files at the location specified in the error message. However, the best solution is to modify the existing installation and turn the ITE feature back on. Locate the ITE feature in the custom install list and mark it as “Will be installed on local hard drive” . Click through the rest of the screens and let the installer modify your installation. Now you can apply Update 1. Once Update 1 is installed you can repeat the above instructions to turn the ITE feature back off if you do not want it installed.